As the holidays come up, it's important to have a good idea of what to wear. Not sure what to do when the invite says "festive"? Check out my post on Twenty York Street about what to wear for your next holiday shindig. No Santa cat sweaters need apply! I love that shirt. It definitely is festive!! That shirt is very festive. I never really understood what "festive" dress is. I always translated it to sparkly. Love the sequin top you are wearing!!!! Ah! You look gorgeous! I love love love the (very festive!) shirt and your hair. Great holiday ideas. 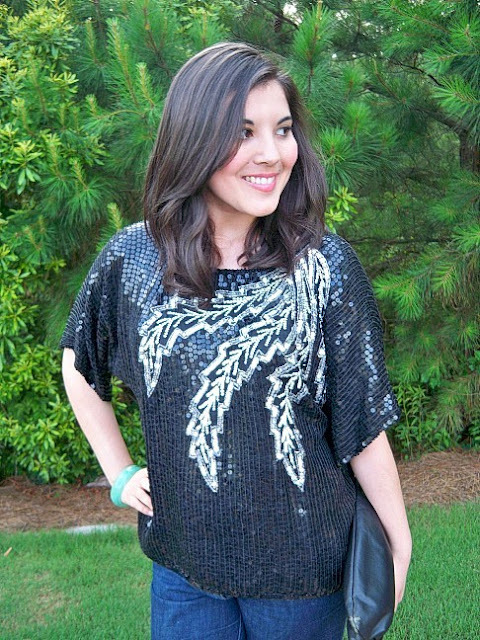 i love love love this sequin shirt! amazing. I've been looking for something similar! oooh, i love that sparkltop for the holidays! It's definitely perfect. You look too cute in that shirt! Very festive! These are great tips and I loved your guest post on 20 York Street. I have found the black dress with statement necklace combo to be a reliable standard for my festive attire. Hope you get to break out your party duds frequently this year! um, gorgeous much?? this is the most beautiful picture of you! !